Sri Lanka is the only unique holiday destination that offers all the excitements within a very short reach and in different climates. Wonderful beaches, marvellous mountains, lush green forests, exciting wildlife, spectacular cities or ancient history, whatever you are looking for, this destination satisfies your needs in every aspect. Sri Lanka, the magnificent island of paradise, is on the Indian Ocean south of India and is widely known as the Pearl of the Indian Ocean, owing to the bizarre beauty and majesty, which Sri Lanka is loaded with. Being a multi-religious and multi-ethnic country with a total population of 19 million, Sri Lanka is very unlikely to be described without being driven into a great description as the island is in possession of multiple cultural values; traditional dance, a procession of elephants, masked devil dance and Ruins are to name a few. On top of what nature has to offer, what is being greatly appreciated by the visitors to the island is that the Sri Lankan hospitality, the affable attitude of Sri Lankan and the delicious delight of the local food. Apart from all the beauty and joy that this island of paradise is teemed with, Sri Lanka has the highest literacy rate in South Asia. English language is widely spoken within the island. Known to travelers from ancient times, Sri Lanka continues to entice visitors with its breathtaking scenery, palm-skirted beaches, cool hill country and historic monuments. Sri Lanka is one of the smallest land masses on earth to be full of such an amazing variety of experiences for the traveler. Tropical forests harbor pristine wildlife sanctuaries, significant Buddhist relics and religious monuments are found in the undulating highlands while deserted golden sand beaches make up the southern coast. Ornithological tours (Bird watching): Variegated climatic and environmental zones ranging from dense and humid tropical forests, montane patnas to semi-arid scrub jungles dotted with natural and man made water holes and irrigation tanks, extensive lagoons and lakes are host to an unbelievable variety of endemic and migrant birds. Rain forest and full of endemic. It's a home for 427 birds including 27 endemic 158 migrating. Wild life tours: The exquisite mating dance of the peacock, the stealthy stalk of the leopard, the majesty of that giant pachyderm; the elephant, the grace of innumerable deer and elk, the inimitable shriek of the uniquely Sri Lankan jungle fowl are all encapsulated in this small but paradisiacal land mass. Biodiversity: Darwin probably wasn't informed about Sri Lanka. Instead of the suspension of evolutionary time as in the Galapagos, the fastidious monsoon winds have endowed this island with a unique matrix of climatic zones. Evolution has followed suit to create fauna and flora as diverse as to make mere identification a daunting task. Ayurveda: Allopathy as we know it was a recent introduction. The practice of Ayurveda or herbal medicine dates back over millennia meticulously recorded on natural Ola leaves in a script that only the practitioners and cognoscente can read. Aided by the natural biodiversity and enriched by infusions from China and the Indian sub-contingent its amazing healing powers are now famed far and wide. Whale watching: Numerous whales of different species are attracted to the North Eastern and North Western shores of Sri Lanka. Studying their movements and watching their antics is now a pleasurable pastime for many tourists. Safari tours: Observe how the animals behave in their own turf with no restrictions by going on a safari trip with your own tour guide. You will get the opportunity to visit all those wonderful places and exotic animals in Sri Lanka that the guide books rave about and some secret hideaways which will be kept hidden from the outside world and would be only known to the natives of that part of the country. Not only lions and leopards hunting for prey but elephants crossing the road, clusters of deer peacefully drinking water in waterfronts and kingfishers patiently waiting for their catch of the day are a common site when you go on a safari tour in to the wild side of Sri Lanka. Trekking & Hiking: A lesser known fact is that the central region of the Island is a ruggedly beautiful "Hill Country" which rises to an elevation of about 2500 meters. The route to this area is through narrow passes between many ranges of hills with breathtaking views all around. This mountain area of Sri Lanka is veritable paradise for the dedicated hiker. The towering central hills, peaks covered with evergreen cloud forests the verdant valleys and dense jungles are interlaced with footpaths that overlook breathtaking scenery and an immense variety of fauna and flora. The occasional villager one encounters is friendly and helpful to strangers. Amazing hideaway waterfalls with natural pools are the additional ornament in decorating this Island Nation. Sri Lanka is one of the countries that are never free form lively festival a whole year round. Visitors will have an exceptional experience for witness its bright and colorful tradition of Sri Lanka if they stumble on the festive period. Most festivals in Sri Lanka are related to religion and depend on the lunar calendar, encompassing Buddhist, Hindu, Muslim, and Christian festivals. Apart from the religious holidays, Sri Lankan people also enjoy their national holidays, proving well the entertainment -lover-mind of people in this country. The followings are some major festivals of each religion in Sri Lanka. Duruthu (January): The full moon day of January marks the first visit of the Buddha to Sri Lanka. In memory of this visit, a procession consisting of well-decorated elephants, dancers, and drummers is held for three nights at Kelaniya (10 kilometers from Colombo). Vesak (May): This full moon day is a day of the great significant for the Buddhists around the world for it marks the Birth, Enlightenment, and Decease of the Buddha. The Buddhist houses on the island are decorated with bright Vesak lanterns. The alms halls offer free meals to passer-by and Buddhists go to temples or shrines for religious observance. Poson (June): Poson commemorates the day Buddhism was introduced into Sri Lanka by Arahat Mahinda. There are processions held in many parts of the country in reminiscence to this celebrated Buddhist apostle who took Buddhism to the Island. But the celebrating centers on this day are at Anuradhapura and Mihintale. Esala (July/August): July to August is a month of religious celebrations in several parts of the country, but the biggest and most famous is the Festival of the August Moon or Kandy Perahera at Kataragama in the eastern part of the country. In Kataragama, colorful processions are held for two weeks with an amazing "fire walking ceremony" to express respect and sacrifice to the God Kataragama, regarded the Warrior God. Unduvap (December): This full day is a memorial day of Sangamitta, Asoka's daughter, who brought a sapling from a scared Bodhi Tree in India to Sri Lanka. The tree grown from that sapling still stands in Anuradhapura today. Vel (July/August): This Hindu festival is held to honor the War God Skhanda in Colombo. The city's main streets are used for the magnificent processions of colorfully decorated chariots, accompanied by music and dance. Deepavali (October/November): Also known as the festival of lights, Deepavali festival takes place in late October or early November. Thousand of oil lamps will be lit to celebrate the victory of good over evil and the return of Rama (the legendary character of the Hindu epic Ramayana, believed to be an incarnation of Vishnu) after his period of exile. Lakshmi, the goddess of wealth is worshipped on the third day of the festival. Muslim community is quite isolated from other ethnic group, their celebration are not then displayed to public. Most of Muslim festivals are also closely connected to religion. The main Muslim festivals are the Milad-un-Nabi or the birth of the Prophet Mohammed in December, Id-ul-Fitr marking the end of the holy fasting during the month of Ramadan, and the Haj festival when Muslims make their pilgrimages to the holy Muslim shrine in Mecca. When it comes to national festivals, the most expecting, most colorful, and most vibrant festivals of the nation is the traditional New Year Festival. The festival is when the two major ethnic groups in Sri Lanka, the Sinhalese and the Tamils jointly celebrate this happy time, but in different styles according to their original tradition. Although the conventional New Year is the 1st January, traditional New Year (Avurudu) of the Sinhalese and the Tamils occurs in the 13th or 14th April each year according to their lunar calendar. The precise days and times of celebration of the end of the old year and the beginning of the New Year are determined by the astrologers. The auspicious time is marked by the entry of the Sun from the zodiac sign of Pisces (the last phase of the Sun cycle) to Aries (the first phase of the Sun cycle). The festive period continues for about a week. The festival also coincides with the end of the harvest season and the beginning of new season. People enjoy the brand new day of the New Year by cleaning their house, buying their new clothes, and eating special meal in a union of family members. Unlike the long, continual Sinhalese New Year celebration, Hindu Tamil New Year is confined to the first day of the Year and is over within hours. Come and enjoy, Sri Lanka's inviting sunny beaches. Sri Lanka's beaches are very popular for relaxing, sun bathing and surfing. Bentota, Beruwala, Hikkaduwa, Galle, Negombo and Trincomalee are the famous beaches. Explore the living heritage of Sri Lanka of 2500 years. Experience the diverse culture. Witness the 8th Wonder of the World, Sigiriya . Meet with Sri Lanka's indigenous people of Sri Lanka, "Veddha's" - known as aborigines of Sri Lanka. Elephants, Leopards, Black Bears and many more............... Where else can you see all these wild animals?. Meet face to face with Jungle Giant - Elephants in Sri Lanka's wildlife sanctuaries. Witness the unmatched bio-diversity of Sri Lanka. Waterfalls, misty hills, breezy mountains and Sinharaja Rain Forest - only one of its kind, a world heritage named by UNESCO. 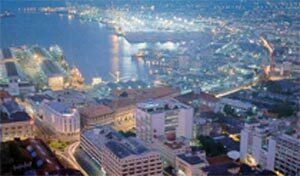 Colombo: The Sea -port capital of the Island, commercial and administrative center of over 1 million inhabitants. Places of interests are: the 'Pettah' wholesale market; the business center of "Fort", the residential area of Cinnamon Gardens, several Buddhist Temples, Hindu Kovils and Christian Churches, the Town Hall, Victoria Park, the War Memorial, and the parliament at Kotte. Ideal for shopping with great bargains at the large shopping centers. International Airport at Katunayake is 24 miles (1 hour drive) north of Colombo. Negombo: A sea resort North West of Colombo, known as 'little Rome' for its predominantly Catholic population, is a big fishing center. The best place to photograph fishermen and their picturesque vessels-the catamarans. Anuradhapura: This is Ceylon's ancient Capital (5th century B.C. to 10th century A.D.) now declared a Buddhist holy city. Amongst the many religious and historical sites are the Sri Maha Bodhi (Sacred Bo Tree), the oldest documented tree in the world which came from a sapling from the tree under which the Buddha gained enlightenment; the Brazen place built in the 2nd century BC, several majestic dagobas such as Ruwanweli Seya, and of course the Thuparama Dagoba which is the oldest in the country and believed to enshrine the collarbone of the Buddha. Mihintale: A rock temple in a serene setting, marks the site where Arahath Mahinda introduced Buddhism to Sri Lanka. Aukana: Magnificent undamaged image of the Buddha from the 5th century. Polonnaruwa: An ancient medieval capital of Ceylon, still retains the beauty of its monuments, giant statues and dagobas built by the Kings of Ceylon. Many interesting well-preserved temple shrines and other buildings mostly of 12th century vintage. Of special significance is the "Gal Vihare" (Stone Temple) with three of the world's most exquisite Buddha images carved out of solid granite. Sigiriya: A monolith that raises 600ft from the flat scrub jungle, and once contained the place and gardens of patricide King Kassayapa. Tackle the giddy climb up Sigiriya Rock, to view the remains of the royal citadel on the summit. The famous frescoes are painted in a sheltered pocket on the sheer cliff face. Dambulla: Rock Temple with beautiful Buddhist murals. 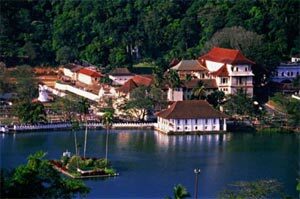 Kandy: Almost encircled by the Mahaweli ganga - Sri Lanka's longest river, this picturesque town built around a man made lake is Sri Lanka's Hill Capital. Home to the sacred Temple of the Tooth Relic. Close by is the Royal Botanical Gardens at Peradeniya with its fine collection of Orchids. The Kandy Arts & Crafts Association and the market area are also interesting places to visit. Daily cultural shows featuring Sri Lankan dances. Pinnawala: An interesting and amusing visit to an elephant orphanage where one can come in close contact with the near 100 orphaned elephants while they are given their daily bath and feed. Nuwara Eliya: Nestling 6,200 ft. in the central mountains, in a region where Ceylon's best teas are grown, this was a hill resort for the British Tea Planters and still is for the locals who prefer the cool climate. Also boasts of a fine 18 hole, Golf Course. Bandarawela: Quiet countryside in the hill country amongst tea plantations - salubrious climes, ideal for scenic treks and relaxation. Ratnapura: The "City of Gems" - center of Sri Lanka's gem mining industry. Hikkaduwa: Beach resort famous for its coral reef, marine life and sapphire seas Scuba diving and snorkeling equipment available on hire at most Hotels in the area. Galle: 72 miles from Colombo on the south coast, this fortified sea-port city of the Dutch who ruled maritime Ceylon from the mid 17th Century to the close of the 18th Century, still boasts of a well preserved fort and ramparts which contain many gracious old Dutch houses, an old Dutch church and monuments with armorial bearings. Beruwala: A coastal town very near Bentota - an easygoing place to laze, swims and soak up the tropical sun. Mount Lavinia: 6 miles south of Colombo. Yala: Yala is a national park and covers almost 1000 sq.km of scrub, lagoons and rocky outcrops in the country's south east and is a particularly good place to see Elephants. There are also Leopards, Bears, Deer, Crocodiles and wild Peacocks. It's best seen by four wheel drive. Nearby Bundala National Park is Sri Lanka's best spot for bird watching. The Fort: Covering no more than 500 sq m, The Fort area lies immediately south of the harbour. During the European era, ‘'Fort'' was indeed a fort, surrounded by the sea on two sides and a moat on the landward side. There are little remains from either the Dutch or the Portuguese periods. Today however it is dominated by, modern structures such as the World Trade Centre, many large banks, airline officers etc. Galle Face Green: Situated immediately south of the Fort, the stretch of land between the Galle Face Hotel and the Ceylon Continental Hotel is the Galle Face Green. It was originally cleared by the Dutch to give the cannons of Fort a clear line of fire. Today however it is a popular rendezvous spot, recently upgraded. It is also very popular among the locals who come to exercise and relax It can get quite busy during weekends with lots of food stalls and vendors selling knick-knacks. Independence Memorial Hall: independence Avenue, Colombo 7. It was in this hall on the 4th February 1948, that the signing of the independence from Great Britain took place. Celebrations take place every year and the building is of nice architecture with stone carvings and paintings. Parliament Building: Parliament Road, Sri Jayawardenapura, Kotte, The impressive new parliament building designed by renowned Sri Lankan architect Geoffrey Bawa. It stands in the middle of a lake surrounded by parkland. It is a very popular gathering spot in the evenings with lots of salesmen and food stalls. The parliament is not open for the public. Pettah: Is one of the oldest districts in Colombo -- Colombo's treasure chest or bazaar. You can find just about any item you are looking for in Pettah's maze of small streets, with shops hidden in all corners. Shops selling the same kind of items tend to cluster in a particular street. If crowds make you claustrophobic then it will be wise to visit on a Poya day, or take a trustworthy guide. Colombo's bus and train stations are located on the east and south fringes of Pettah. Vihara Mahadevi Park: Colombo's biggest park, originally called Victoria Park but renamed in the 1950s after the mother of King Dutugemunu. From March to early May, it is notable for its superb flowering trees. On the west side is situated a carnival and a playground for children. Elephants can frequently be seen taking a bath and spending the night in the park, which is usually taken up by strolling lovers during the day. Zoo: Dharmapala Mawatha, Dehiwela. Tel: 271 2751.Open 8:30am-6pm daily. Situated 11km from the Fort, the zoo has a fine collection of animals, birds, reptiles, and fish from all over the world. The aquarium displays over 500 varieties of aquatic life. Also, walk through the Aviary, Reptilian, and Butterfly Park. There are daily elephant performances at 5:15pm. Admission fee adults Rs.200 children Rs.100. There is a charge for bringing a camera. When entering any temple or religious site, it is customary to remove shoes and walk barefoot. Women should wear long pants or skirts with a modest blouse. Men should wear long trousers. Never pose beside a Buddha statue and when greeting a Buddhist monk or Hindu swami, no not shake hands and if you wish to offer a gift do so with both hands. Kelaniya Raja Maha Vihara - Kelaniya: The most important Buddhist Temple in Colombo and the second most visited Buddhist temple in Sri Lanka, after the Temple of the Tooth in Kandy. The temple dates back from about 1300. 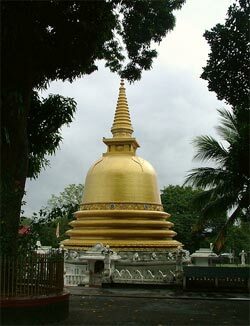 The Buddha is said to have preached at this temple over 2000 years ago and the ‘'Mahavansa'' recorded that the original stupa enshrined a gem-studded throne on which the Buddha sat. The temple later constructed on the spot was destroyed by Indian invaders, restored, destroyed again by the Portuguese, and restored once again in the 18th and 19th centuries. The dagoba, which is unusual in being hollow and is shaped in the form of a ‘heap of paddy'. The dagoba is the focus of a festival called the Duruthu Perahera held in January each year (Festival with parading dancers, drummers and dressed up elephants), which draws thousands of pilgrims from all over the island. There is also a very famous image of the reclining Buddha as well as many Hindu deities at the temple. Gangarama Vihara: 61, Sri Jinaratana Road, Colombo 2. Tel: 232 7084/ 243 5169. Email: gangaramaya@lgo.lk Website: www.gangarama.lk One of the famous and beautiful temples in Colombo. It is beautifully decorated with stone carving, brass work, and other forms of Buddhist art. The temple is not only a place of worship but also a centre of learning. Every Tuesday and Friday, meditation classes are held from 5.00 till 6.30 p.m. under the guidance of a well-known meditation teacher It also has a museum, complete with temple and residential hall. The temple is widely known for organizing the famous Nawam Perahera, a religious procession, held around the Full Moon Poya day in February. Hundreds of dancers, dressed in traditional costumes representing the different dance traditions of Sri Lanka, accompanied by drummers, colourfully dressed up elephants (the temple possesses six elephants and tuskers) and over 500-700 Buddhists monks from all over the island take part in the procession dressed in their saffron robes and carrying the Vatapatha (fan). It's a marvellous performance, which attracts many devotees, spectators, and tourists. Definitely not to be missed! The small temple in the middle of Beira Lake, which is called Simamalaka, is also part of the Gangarama temple and is nearly a century old. The original Simamalaka fell into ruin and collapsed into Beira Lake. The present Simamalaka was opened on the 10th of February 1979. A model of the foot of the Buddha sculptured in marble, has been donated to Gangaramaya temple, and is placed in the Simamalaka. On either side of the entrance to the Simamalaka on the wall, are beautiful works of sculpture,. The sculpture on the right depicts unwholesome actions and their bad consequences, the wholesome actions and their good results. The sculpture on the left wall, tells the story of Sri Lanka's 2500-year-old history and the important events in the Buddhist religion. Kathiresan Kovil: Sea Street, Colombo 11, Pettah. Hindu temples are also known as ‘'kovils''. The Kathiresan kovil is one of the oldest in Colombo and dedicated to the war god Skanda.The temple is the starting point for the annual Hindu Vel Festival when the huge trident chariot is dragged to kovils in Bambalapitiya. Colombo 11. Situated behind the Fort Railway Station it is reputed to be the oldest and one of the largest Hindu temples in Colombo. Houses shrines dedicated to Shiva and Ganesh. The Grand Mosque: Mosque Lane, Kotahena, Colombo 13. It is the largest and most important mosque for the Muslim community. Jami-Ul-Alfar Mosque: Corner of 2nd Cross-and Bankshall Street, Pettah. It is a very decorative mosque dating from 1909 with its candy-striped red and white brickwork. Wolvendaal Church - Ratnajothis Saravanamuttu Mawatha, Kotahena, Colombo 13. Dating from 1749 it is the most important and famous Dutch building in Sri Lanka.It is prominently placed on a hill, shaped in the form of a massive Greek cross commanding a view over the harbour. With walls 1.5m thick, the real treasure is its Dutch furniture. Its Doric façade is solid and heavy. The Dutch governors had a special pew made with elegant carved ebony chairs and the workmanship on the wooden pulpit, baptismal font and lectern is beautiful. The stone floor includes elaborate tombstones of five Dutch governors. St. Lucia's Cathedral - St. Lucia's Street, Kotahena, Colombo 13. The cathedral, in the Catholic heart of the Kotahena district, is the biggest church in Sri Lanka, able to hold up to 5000 worshippers. The Pope conducted a service here in 1994. It is a huge grey structure with a classical façade and a large forecourt. Begun in 1876 it was completed in 1910.Inside are tombs of three French bishops. The National Museum: Sir Marcus Fernando Mawatha, Colombo 7.Tel: 269 4366/ 269 4767. Open 9am-5pm.Closed on Fridays. The National Museum was established in 1877. Best known for its collection of antiques and objects d'art displaying the cultural heritage of Sri Lanka. It houses the throne and other royal insignia of the last king of Kandy, Sri Wickrema Rajasinghe. A section of the first floor houses the Puppetry and Children's Museum. Its library has a collection of 500,000 books including very valuable and rare ones and more than 4,000 ancient palm leaf manuscripts. The museum also houses statues, coins, furniture etc. Admission fees are Rs.65 for adults and Rs.35 for children. Natural History Museum: Sir Marcus Fernando Mawatha, Colombo 7. Tel: 269 1399.Open 9am-5pm.Closed on Fridays. Situated in the same premises as the National Museum (same entrance) it displays the Natural Heritage of Sri Lanka. The fauna are displayed in dioramas and there are sections on Applied Botany, Geology and Fossils and the Natural Environment. Admission fees are Rs.35 adults and Rs.20 children. The Dutch Period Museum: Prince Street, Colombo 11, Pettah. Tel: 244 8466.Open daily except Fridays from 9am-5pm. Located in an old mansion built in the period of the Dutch occupation and was opened to the public in 1982. The building has the unique features of a colonial Dutch town house and the museum displays furniture, ceramics, coins, arms, costumes etc. Admission: adults Rs.50 and children Rs.25. The British Council: 49, Alfred House Gardens, Colombo 3. Tel: 258 0301.Open 10am-6pm.Closed on Sunday, Monday and Poya days. Membership is required. Has English literature, reference, and resources. Also has an extensive video and cassette library. National Library of Sri Lanka: 14, Independence Avenue, Colombo 7. Tel: 269 8847/ 268 5199.Open 9am-5pm.Closed on Monday. Membership required. It is a reference library only so no books may be allowed to take out. The library holds a collection of Ola leaves dating back many years. Public Library: Marcus Fernando Mawatha, Colombo 7. Open 8am-6: 30pm.Closed on Wednesday. Membership required, for a nominal fee. The library has a large variety of books and magazines in all three languages. Eco House: 294, Park Road, Colombo 5. Tel: 250 1303. A place for unknown artists to exhibit their talents and work consisting of paintings, sketches, sculpture, and other works of art. Website: http://www.barefootgallery.com Email: artgallery@barefoot.lk Its open spaces are ideal for exhibitions, be it paintings, sculptures, furniture, photographs etc. Sometimes the gallery is even used to stage plays, recite poems, or listen to live music. Lionel Wendt Memorial Art Centre: 18, Guilford Crescent, Colombo 7. Tel: 269 5794. Open 9am-1pm & 2pm-4pm Mon-Fri. Houses contemporary art and craft exhibitions. There is always something happening at the Lionel Wendt be it sales of antiques, exhibitions of paintings, sculptures, photographs or posters. The Sapumal Foundation: 32/4, Barnes Place, Colombo 7.Tel: 269 5731.Open 10am-1pm Thur-Sat. Some of the best examples of Sri Lankan art from the late 1020's onwards is exhibited in this former home of the late artist Harry Peiris. Serendib Gallery - 36, 1/1 Rosmead Place, Colombo 7. Tel: 4710002. Open 11am-6pm. Email: info@theserendibgallery.com www.theserendibgallery.com. One of the best known galleries it exhibits a permanent but changing variety in paintings, drawings and sculpture. It also specializes in antique books, drawings and sketches on Sri Lanka. Empire Theatre - 51, Braybrooke Place, Colombo 2. Tel: 232 3250. Liberty Cinema - 35, Dharmapala Mawatha, Colombo 3. Tel: 232 5264-66. Majestic Cinema - Level 4, Majestic City, Colombo 4. Tel: 258 1795. The Savoy - 12, Savoy Building, Colombo 6. Tel: 255 2877. Government: Sri Lanka, is a free, independent and sovereign nation with a population of 18.774 million (1998 mid year estimates). Legislative power is exercised by a Parliament, elected by universal franchise on proportional representation basis. A President, who is also elected by the people, exercises executive power inclusive of defense. Sri Lanka enjoys a multi party system, and the people vote to elect a new government every six years. National Flag: National Flag of Sri Lanka is the Lion Flag. A Lion bearing a sword in its right hand is depicted in gold on red background with a yellow border. Four Bo leaves pointing inwards are at the four corners. Two vertical bands of green and orange at the mast end represent the minority ethnic groups. It is an adaptation of the standard of the last King of Sri Lanka. Languages: Sinhalese & Tamil English is widely spoken throughout Sri Lanka, with the exception of remote villages. Climate: Low Lands - tropical, average 27C, Central Hills - cooler, with temperatures dropping to 14C. The south-west monsoon brings rain to the western, southern and central regions from May to July, while the north-eastern monsoon occurs in the north and east in December and January. Sri Lanka has a good climate for holiday-makers throughout the year. Industries: Processing of rubber, tea, coconuts, and other agricultural commodities; clothing, cement, petroleum refining, textiles, tobacco. Agricultural Products: Rice, sugarcane, grains, pulses, oilseed, roots, spices, tea, rubber, coconuts; milk, eggs, hides, meat. Currency: Sri Lanka follows decimal currency system in Rupees (Rs.) and cents (Cts.) with 100 cents equal to a rupee. Currency notes are available in the denominations of Rs. 2,10,20,50,100,200, 500 and 1000. Coins are issued in values of Cts.1,2,5,10, 25 and 50 and Rs.1,2,5 and 10. The intervention currency continuously will be the US Dollar. Working week: Sri Lanka works a five-day week, from Monday to Friday. 8.30 a.m. - 1.00 p.m. on Saturday. The Central Mail Exchange, at D.R.Wijewardene Mawatha, Colombo 10, (Telephone : 326203) is open 24-hours. Location: An island off the south-eastern cost shores of India, 880 km north of the equator, in the Indian Ocean. Sri Lanka's idyllic landscape and a mercurial mix of opportunities make it the ultimate holiday destination. May you have the gift of long life! With this traditional greeting, we welcome you to Sri Lanka, the garden of Eden, "the original paradise, amid scenes as beautiful as the hand of God ever created". Many a traveller before you, from ancient mariners and merchants, to modern astronauts and businesspeople, have been seduced by the tantalizing beauty of the colours and costumes of this land which, according to Mark Twain, were "All harmonious, all in perfect taste"
Today's Sri Lanka welcome its visitors to experience the nation's glittering tapestry of culture, and the rich abundance of nature, so handsomely bestowed, and to give credence to the old adage - that good things come in small packages. Sri Lanka's archaeological treasures bear testimony to a civilization that spanned the golden age of Periclean Greece, the Roman Empire, Mayan citadels, and Napoleonic grandeur. The resultant legacy is a culture embellished by the more recent influences of Western colonizers, and Eastern traders, producing a mercurial mix of races and religions, arts and crafts, festivals and costumes that enchant the visitor with their exquisite variety. To these man-made riches, add the God-given blessings of nature: azure seas, sandy beaches, verdant hills, cascading waterfalls, abundant wildlife, a riot of flowers and fruits, coconut groves, spice gardens, tea estates - and no wonder, the smiles of this paradise beckon the visitor to savour the kaleidoscopic experience ever so much longer, lest he awake, from what must surely be a wide-angle dream in Technicolor! Ringing the island's miles of uncluttered white, sandy beaches, where sun-seekers and fun-lovers are caressed by gentle, ocean breezes. Rising amid spectacular waterfalls to mist-shrouded peaks is the central hill region home to the world famous "Pure Ceylon Tea" gardens, and the legendary gem mines that produce sapphires, rubies, and a dozen other gems. As you travel from the lowland plains to the highlands in air-conditioned coach or car, a panorama of people at work or play unfolds. Roads share space with cars, carts, bikes, bullocks, and even elephants. The roadside is vibrant with life, and the lush landscape presents a palette of changing colours. Pause, if you would, at wayside markets, handicraft shops or batik factories. Or stop to watch craftsmen at work, gems being mined, tea leaves being plucked, elephants bathing in rivers or fishermen on stilts. Colombo, the main point of entry, is a bustling metropolis of big businesses and small bazaars; while Kandy - the last royal citadel - is the cultural center and home to the legendary Temple of the Sacred Toot Relic, and the spectacular festivals of the perahera. Galle, the ancient port of Tarshish, is a town within a medieval fortress; while Nuwara Eliya, in the salubrious up-country, nestles amidst picturesque tea gardens and dazzling waterfalls. In the "Rajarata", or king's domain, are the ancient cities of Anuradhpura, Polonnaruwa, Dambulla and Sigiriya - all treasured Antiquities of a priceless heritage over 2,500 years old. The western coastline from Negombo, north of the airport, to Tangalle, in the south shelters a string of magnificent beach resorts and quaint fishing villages. At the many national parks, wild elephant, leopard, bear, and a host of other fauna and flora. Cities and resorts cater to visitors, with hotels ranging from the luxury five-star class, international chain properties, to the much more moderate-budget hostelries. Most hotels offer a culinary extravaganza to pamper guests with a variety of cuisine from the East and the West, as well as local dishes that reflect the elastic tastes of seafarers, invaders, and traders that came ashore over the centuries. The individual businessperson, and the group of conventioneers will both find opportunities to invest or trade under generous incentives offered by a government committed to promotion of Free Trade. Sri Lanka's high-literate population, fluent in English and proficient in technology, and trained under a social system which has nurtured free education from kindergarten through university for the last 65 years, is one of the most competent labour markers in the world. Sri Lankans know no word for "goodbye". Thus, when the time comes to leave these shores, we will not bid farewell, but invite our guests to return - again and again! For nationals of most countries, visas are issued on arrival for 30 days. Extension of tourist visas is handled by the Department of Immigration and Emigration. Bld # 120, Nursing Chowk, Thamel, Kathmandu, Nepal.